Demolition methods have changed dramatically in the last couple of decades. While the wrecking ball is still a powerful symbol for our industry, it is rarely used in modern demolition. Today’s demolition contractors are much more likely to use high reach excavators with precise attachments to take apart buildings piecemeal. Why? Because C&D (construction and demolition) materials can bring a handsome salvage price, offsetting demolition costs. For instance, by salvaging 82% of materials from the Marion County Senator Block in Salem, Oregon, the county saved $160,000. As in so many modern innovations, demolition clients’ financial interests happen to align with environmental best practices. By salvaging as much as possible from demolition sites, contractors can significantly reduce the amount of C&D trash sent to landfills each year. Back in 1996, when the EPA last reported on this topic, the United States was producing 136 million tons of C&D waste per year. That’s 40% of the country’s total solid waste. Expert demolition contractors can salvage up to 95% of building materials through reuse and recycling. Scrap metal, wood, and other salvage commodities can fetch sizeable returns for clients. Demolition salvage is a win-win situation, to be sure. However, materials must be removed and sorted with care to avoid reducing value and recyclability. Let’s take a look at demolition methods contractors can take to salvage C&D waste. 1. Keep Reusable Fixtures Intact. Plumbing fixtures, windows, floor tiles, and many other building parts may be repurposed in new projects. However, these elements must be kept intact to facilitate reuse. Demolition contractors must take care to remove fixtures without causing damage. 2. Remove Drywall, Lumber, and Other Building Materials in Large Pieces. Demolition contractors should aim to remove asphalt, drywall, lumber, roofing materials, metals, and other types of recyclable building materials in large pieces, to facilitate salvaging efforts. 3. Sort Materials as They are Removed. Just as consumers must typically presort their recyclables before putting them on the curb, demolition contractors must sort different types of demolition materials before they can be recycled. For instance, concrete remnants should be kept in a separate pile, for resale or crushing and reuse on site. Roll-off bins make good on-site storage containers for sorting building materials. 4. Consider Salvaging Efforts in Project Planning Stages. By thinking about how to recover materials during project design, contractors can maximize the overall percentage of recycled materials. Likewise, by including recovery goals in project bids, clients can ensure contractors are aware of salvaging expectations. 5. Provide Initial & Ongoing Worker Education. Without proper knowledge, workers may unwittingly contaminate recycling bins. To maximize recovery rates, demolition crews and subcontractors must be briefed on best practices for salvaging materials. 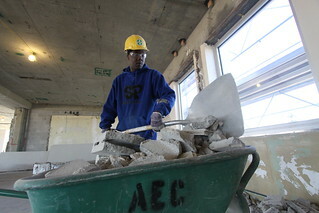 Additionally, demolition workers should receive regular feedback and reminders on how to best implement salvage plans. Finally, when salvaging building materials, think outside the box. C&D salvaging is rife with opportunities for improvement and innovation. For instance, when demolishing the Bagley Downs Apartments complex on campus, the University of Oregon initially planned to tear apart the buildings and salvage as much as possible. However, the Saint Vincent de Paul charity stepped forward and asked to have the buildings relocated for reuse as affordable housing. The university was able to move the apartments, completely avoiding demolition costs. The Eugene community now enjoys 30 more affordable housing units as a result, and at about half the cost of adding new structures. This kind of creativity is pushing the boundaries of C&D waste recovery, benefiting the environment and the end client. This entry was posted in Concrete Crushing & Recycling, Green Demolition, Scrap Metal Recycling and tagged demolition methods, demolition salvage, industrial demolition. Bookmark the permalink. I think that it is a really good to try and recycle concrete once it has been demolished, or cut out of a space. It makes sense to try and up cycle it somehow rather than simply throwing it away. I will have to remember this when we tear out our old concrete steps this summer.